The temperature in the cabinet - 30 ~ - 0 ℃, set freely; Digital temperature display, grasps the running state. Boot time delay, stopping interval protect functions. 100mm over thick insulation, heat preservation effect is good, International famous brand high efficiency compressor. 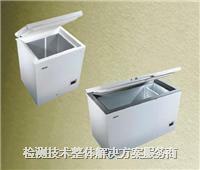 Safe locks, prevent random open; Anticorrosion TaiJieShi bladder, suitable for configuration customize rack.